Carb-conscious pickle lovers can rejoice as it seems the year of the pickle continues. A new restaurant is replacing sandwich bread with pickle buns, because lettuce wraps are so yesterday. The mastermind behind our latest obsession is Elsie’s, a restaurant in New Jersey. The sandwich shop has been serving its signature Pickle Sandwich since 2015, but it only recently gained major recognition. “We are a sandwich shop but, in lieu of bread, we use our Elsie’s signature pickle,” co-owner of Elsie’s Katherine Cohen told Thrillist. “We have a family pickle recipe that we resurrected and we started making sandwiches on our signature pickles and people lost their minds so we just rolled with it.” People are losing their minds over a pickle? Sounds about right. 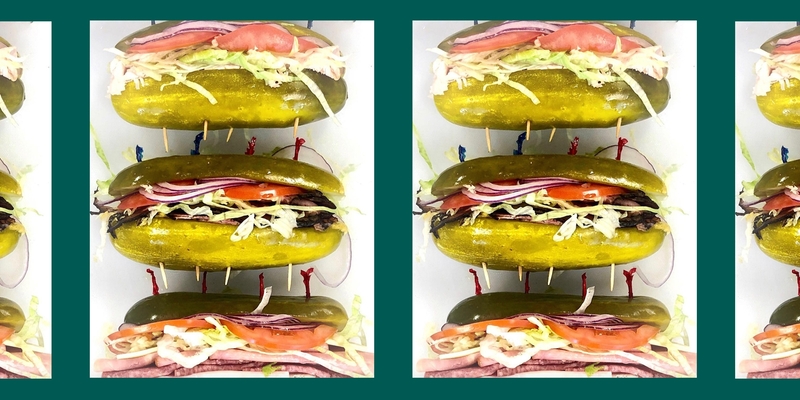 The huge 7-inch kosher dill pickle buns are scooped out before the fixings are placed in between the two parts, and a toothpick helps tie the work of art together. Order from a list of Elsie’s house specials, or build your own pickle sandwich from the long list of deli and veggie fillings. To top it all off, you can order a shot of Elsie’s Pickle brine — yum! Not hungry for a whole sandwich? They also offer a lighter option of gluten-free rollups using cucumbers, and of course, pickles. If the pickle buns aren’t enough to capture your heart (and stomach), maybe their falafel sandwich will. Served with lettuce, tomato, and red onion, the falafel pickle sandwich is sure to be a winner. Thank you, Elsie’s, for giving us the gluten-free sandwich option we didn’t know we needed.